The Rufous Hummingbird, also known as Selasphorus Rufus, is one of the most common hummers. Many folks call this rugged hummer “feisty”. Because it’s quite aggressive once it’s laid claim to the feeder in your yard. The Rufous will usually be successful in chasing other types of hummingbirds away from food sources. Even when resting between meals, this vigorous bird will watch its food source closely. It’s also a “rugged” bird because it travels along one of the longest migration routes. A neat fact I like is that they have wonderful memories. They know which flowers they’ve drained all the nectar from. They know to go only to those that still have food. Similar to all hummingbirds, the Rufous Hummingbird will eat nectar from flowers, sugar water in your feeder, and insects for protein. Feeding times are usually less than 60 seconds. They eat many, many times each day and eat about 3 times their body weight each and every day. Before migrating, they’ll feed until they have doubled their body fat. They also put themselves into an extended period of hypothermia (called torpor). While they spend their winters in southern & coastal California, Mexico, Panama and the Gulf Coast from Texas to Florida, they’ll be found in British Columbia and Alaska during the summer months. As well, they’re seen throughout the eastern part of the United States. When I said above that they have the longest migration routes, this means they travel as far as 2000 miles one way! These are incredibly strong birds with great stamina. Those that travel from Panama and Mexico in the spring actually travel 500 miles over the Gulf of Mexico without making any stops. The Rufous is quite adaptive and this is why it can live in so many different areas. They especially like shrubbery, so keep this in mind as you work on your own hummingbird garden. They’re fine with humans. As long as you provide them a place to eat and sleep with shelter from predators, they’ll stay and be plentiful. On my hummingbird mating page, I describe how many hummers engage in spectacular mating rituals. That isn’t what these little guys do. Instead, they do some diving and chirping but not as theatrical as other species. Once they mate, that’s the end of the interaction between the female and male. The female moves on to build her nest while the male looks for other females to mate with. They hide their nests within shrubbery on low, droopy limbs. Often, females will construct nests close to other nests. It’s not uncommon to find as many as 20 Rufous nests lined up close to one another. Normally, the female Rufous will have 2 eggs about 2 weeks after mating. About 1 week after birth, the babies are already flying. Several weeks after that, they leave their mother and are on their own. With lands being cleared up and down the California coast their breeding and living areas are threatened. While they're adaptive there are ways you and I can help the Rufous. For example, you can research the Bureau of Land Management in the US. It manages wildlife friendly lands and you can learn about fire, grazing and mining regulations. In Canada, the Boreal Songbird Initiative is working to help conserve the boreal forest there. It does this by monitoring inappropriate and harmful drilling, mining, and logging. 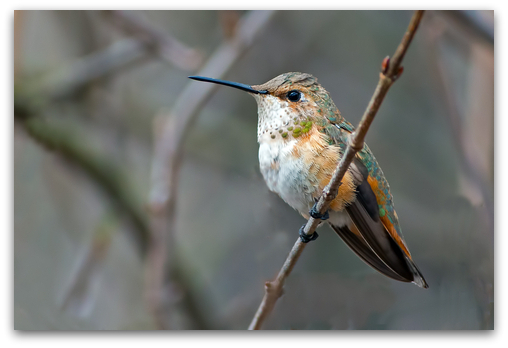 Starting and maintaining your own hummer garden is another great way to provide one additional safe habitat for the wonderful Rufous Hummingbird.